Hiking anywhere! Mostly it’s in the Pacific Northwest and other mountains nearby (Mt Baker) or beautiful areas that beckon…. Outdoors is a playground. I love taking in the textures, cycles and ever-changing vistas. I’m drawn to animals and often encounter them in unique ways, like the day an osprey released a wing feather that landed at my feet. A massive bald eagle flew within ten feet of my head on a bluff walk. One winter day, two owls, not one, two!… perched and watched me as I began a pre-dawn walk. Connection with nature fuels me in a very deep way. I love travelling to new places, trying new foods and experiencing the sacred practices of local wisdom. A special trip in summer 2018. 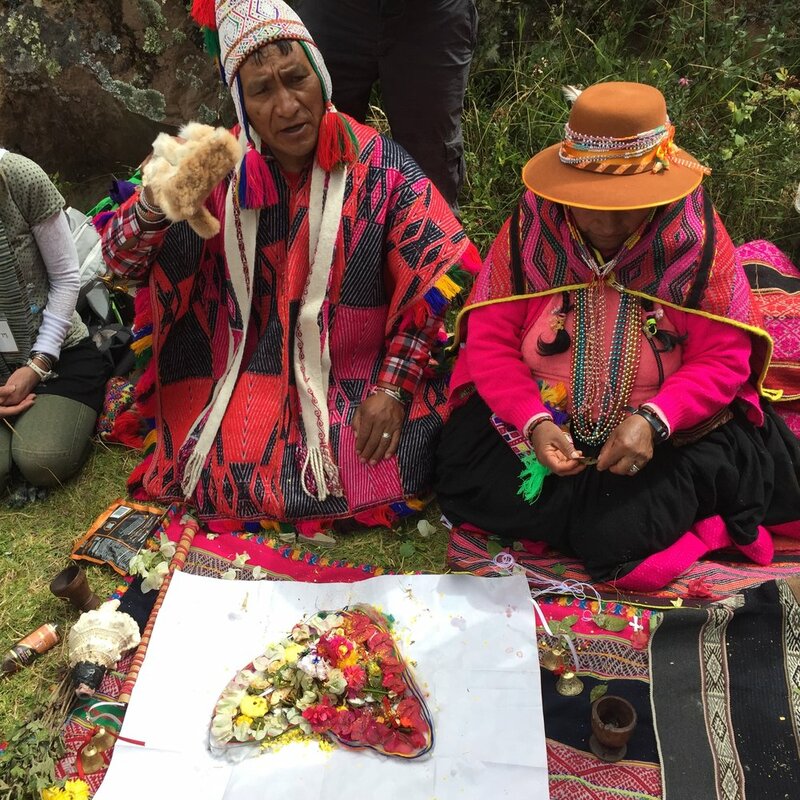 We spent two weeks in the Sacred Valley with Q’ero shaman, daily ritual and a deepening of connection to shamanic practices which revere the earth and spirit planes. As well as going to Machu Picchu, we experienced many sites and did an intensive hike up to Mt Pachatusan with two nights exploring sacred areas there. I’ve recently been training to hold new moon sacred circles as another monthly practice to awaken hearts with the rhythm of nature. Water. Water. Water. This is one of the local beaches close by. I’ve never not lived near the ocean. I grew up close to the San Francisco Bay and loved outings to Stinson Beach and the Marin Headlands. Now, living in Canada, we have the choice of the more commercial White Rock beach or natural, Crescent Beach. Long walks on either are inspiring. As well, I have a studio on Salt Spring Island just a short ferry trip from here. Give me water anytime! The highlight from last summer was watching orcas play…well, feed on salmon…outside our Salt Spring Island home. The constant flux with tidal water amazes me. The patterns, expressions of wind and current, all transfer through me and onto canvas. It’s a joy to bring art into children’s lives and recently I’ve added teaching art one day a week at a local school. With budget cuts and the arts being less of a priority, opening up a young person’s eyes to creative potential not only nourishes their critical thinking but expands their imagination, confidence and innovation capacities. I also volunteer with an amazing local healing farm organization, Sali’s Farm, that facilitates 8-week children’s programs to bring together at-risk children with their menagerie of rescue animals. We foster a relationship, one-on-one, that allows the children to nurture and care for the animals while developing and expressing empathy. It’s beautiful how the children shift toward more open hearts within the two months and the horses, cows, chickens, ducks, bunnies and goats receive the benefits! I’d always enjoyed singing along to music in the car or in the shower, yet it wasn’t until our daughter, Samara, found her passion early in grade school, that choral singing came into my life and is now and inspiration. Sharing choral music is her passion and she’s an amazing leader as she grows her choir family at Crescent Choirs. Singing with two of her women’s choirs opens the creative channel as we meld our voices and hearts together. It’s been a learning challenge on all levels that sparks the intuition and becomes a communal artistic gift that’s shared.